Next in the Best of Eleuthera series I share a great secret with you – the hidden treasures found at the Highway Service Station here in Governors Harbour. Situated on Queens Highway heading south out of Governors Harbour on the left hand side is the Esso gas station owned by the Griffin family. The gas station has been on this site since 1983 but Lawrence Griffin first opened in partnership with Arthur Rolle in 1957. The site was then where Sophie’s Gift Shop is today – just after Burrows Food Store. Initially the two had a workshop and a single gas pump – gas was 47 cents a gallon and was delivered in 55 gallon drums ! 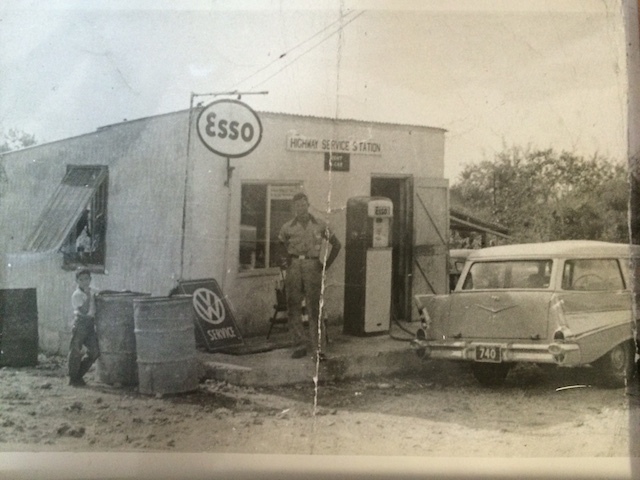 In the 60’s they built the premises which is now Griffin’s Auto Repair – it was run by Lawrence’s late brother Cyril and is now carried on by his son Cyril Junior and his mother Mrs Carol Griffin. Jean – Lawrence’s beautiful Jamaican wife came to Eleuthera in 1962 and from 1967 began working in the business. Their 3 daughters – Gail, Susan and Sophia – all helped out in the gas station from when they were in primary school and now Gail and Susan run the business although Jean and Lawrence are still involved. Lawrence still pumps gas sometimes if no-one else is around and Jean still has a hand in selecting a lot of the items sold in the store. Lawrence, Sophia, Gail, Jean and Susan – a full compliment of Griffins ! From 1994 when their first granddaughter Alexia was born Jean took a slightly less hands on role although her special touch is still apparent at Halloween, Christmas, Valentine’s Day, Easter, Mother’s Day and Father’s Day. They buy almost all of the snacks and gifts from the US so it is a different selection to what you see in many places on the island. Susan started working full time at Highway in 1989 and Gail in 1993, Susan’s daughter has helped out on occasions – so the next generation are playing their part as well ! The garage sells gas, batteries, tyres and oils – tyres and batteries are of course both supplied and fitted. There are 2 people on the forecourt at all times – and as I said sometimes that includes Lawrence Griffin MBE as well ! Lawrence received the great honor of his MBE in 1999. In July 2014 the Esso station had a complete refit of pumps and tanks although the original tanks were still in tip top condition – when tested they did not have a single leak….. but now the gas pumps look new and modern….. The coming of VAT has meant even more modernization with a computerized till system and a lot more work. Now for some of my favorite top tips ! Highway Service Station has a great selection of Lindt chocolate …..
Also another of my favorites are the rice crackers that they sell….. perfect for dips or with cheese. Good quality cashew nuts and pistachios…..
And a great selection of flip flops !! MBE – means Member of the British Empire – it is an honor bestowed on people throughout the Commonwealth who are recognized for good works that they do…..
Glad to know about this spot.